A nice salad was in order after dinner last night, in which I had the foie gras two ways and a succulent veal sweetbreads & kidney with a fresh morel fricasee. The only green I got with that meal was a sprig of chervil. I woke up in the night worried that I needed to eat more greens. The arugula is out in full force now at the market, and we are beginning to see some of the common roots that will see us through winter. Today we had Franck for lunch and before we served an autumn pepper and rutabaga velouté with crispy duck neck slices similar to this soup and flavourful faisanne (wild pheasant hen) roasted on the spit, we enjoyed a nice salad of celery rave (celery root), carrots, roquette (rocket or arugula), leaf lettuce, parsley and chervil, ciboulette (chives), and radis noir (black radish). The vinaigrette was a mix of fruity olive oil, fleur de sel, plain apple cider vinegar, some of the mixed poultry stock we had going, finished with crushed capers and green peppercorns. The sauce was light and flavorful at once. I took the care to send the soup through the chinois and it really made a difference. I do think it's best to strain it when we have guests. It adds a special lightness and creaminess. The faisanne was absolutely delicious, and each part of the bird tasted differently. We don't think about that much when we eat chicken or other farm raised poultry, but it was really pronounced in the wild bird. Hummm Hello ou Bonjour ? I just discovered your blog and saw you seemed to write from Lyon ! I live in this city too, and so are a few wonderful blog-girls that use to meet quite a lot these days. May I include your blog in the lyon blogs links on mine ? And maybe someday, we'll have the pleasure to meet you ?! Thalie, thanks ever so much for your comment! I would love to meet the Lyon blog girls too! This salad looks superb. 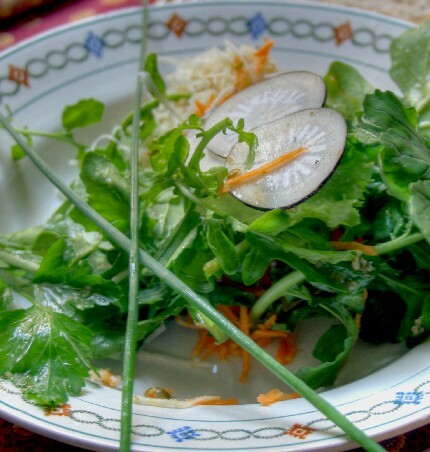 I'm a huge fan of the French grated carrot salads...so simple, but so good! Another great salad with arugula is with braised beetroot and feta: a good fall/winter salad! No Gillian, they don't sell them but what you're talking about does sound really good. I'll keep my eye out for that and pick one up the next time I see one!